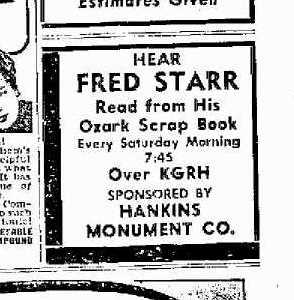 In a previous posts, I have written about Fred Starr, who was an educator, author, and columnist in Northwest Arkansas for more than thirty-five years. In these posts, I mentioned that he was elected to the Arkansas House of Representatives in 1954 and served in that body from 1955 to 1958. These years were turbulent ones for Arkansas as its elected leaders enacted laws and proposed constitutional amendments to maintain Arkansas' segregated schools. Starr did not write anything in his books or his "Hillside Adventures" column about his work in the state legislature, and I have not read elsewhere about his time as a state representative. To find out more about his role in the political events during this tumultuous time, I searched the local paper, the Northwest Arkansas Times, for relevant stories. In 1954, when Starr decided to run for a seat in the state House of Representatives, he had never before run for a political office. However, he was well known in Northwest Arkansas, and the position was to represent Washington County and part of Madison County in the state legislature. Starr had been making speeches to area clubs and schools for two decades, had a weekly hill-wisdom column in the local paper, had had a weekly radio show, and had been a teacher, principal, and superintendent in Greenland, Farmington, and Elkins. Arkansas was still a one-party state in 1954, and Starr ran as a Democrat. He had two opponents in the Democratic primary, whose rules required a candidate to get a majority vote, either in the first primary or in a run-off, to be the party's nominee. In the first primary election, Starr received the most votes of the three candidates, but not a majority. In the run-off, he faced David Burleson, a young Fayetteville lawyer. Burleson, a graduate of Fayetteville High School and the University of Arkansas, had been a pilot during WWII and had been recalled to service for the Korean War, retiring as a Lt. Colonel. Starr and Burleson were both popular candidates, and the result of the run-off election was close: Starr won with 4,080 votes, barely more than Burleson's 3,955 vote. (Burleson was elected to be a state representative in 1958 and held that office until 1967.) Starr had no Republican opposition in the general election held in November. 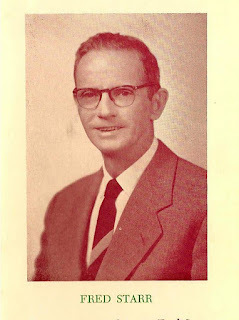 In the same 1954 primary elections, Orval Faubus was elected to his first term as Arkansas' governor, upsetting incumbent governor Francis Cherry. Also, in 1954, the U.S. Supreme Court issued its decision on the Brown v Board of Education of Topeka Kansas case, mandating an end to segregated schools. These two events set the stage for some of the most dramatic and traumatic years in Arkansas' history, and Fred Starr was destined to play a role in the conflict as a member of Arkansas' legislature. In 1955 and 1956, the legislature passed nullification and interposition laws that asserted, basically, the Supreme Court's Brown v Board of Education of Topeka Kansas decision did not apply to Arkansas and that the federal government was not allowed to exercise power over Arkansas schools. In the 1956 general election, voters approved the legislature's "Act of Interposition" and gave a majority vote to amending the state constitution to include an interposition provision (Amendment 47). The laws and constitutional amendment were ruled unconstitutional by the U.S. Supreme Court in the Cooper v. Aaron decision. In the 1957 legislative session, the Arkansas state legislature passed laws to create a Sovereignty Commission with extensive investigative powers; to make persons and groups engaged in certain activities register with the state and report on income and expenses; to drop the requirement for compulsory attendance in integrated schools; and to permit school boards to use school money for attorneys in fighting integration suites. The first two laws were called "Gestapo bills" by opponents. In August 1958, the Arkansas state legislature in special session enacted more than a dozen laws to battle school integration. These included Act 10 requiring state employees to list their political affiliations during the previous five years. Act 15 forbid public employment of NAACP members. Thus, state employees who disclosed membership in the NAACP would be fired. The laws passed in 1958 also gave the governor power to close public schools, and he used that power to close all of Little Rock's high schools for the 1958-59 school year, an action approved by overwhelmingly by city voters in a referendum. More than fifty-five years after Starr took office, it is difficult to reconstruct his legislative career to determine what legislation he supported and what he opposed. It is clear that he was not in a leadership position during the four years that he served. As a backbencher, his votes were rarely mentioned by newspapers. The Northwest Arkansas Times, the local paper for which he wrote "Hillside Adventures," provided sparse coverage of the state legislature during these years. Nevertheless, we can get some insight about Starr's votes on anti-desegregation legislation in two ways. First, we can conclude from newspaper accounts of legislative sessions that Starr voted for every legislative proposal to resist desegregation of Arkansas schools that came before the house of representatives. This conclusion is based on the fact that all of this legislation passed with very few -- usually one or two -- representatives voting against it. From all indications, Starr was never among those who voted against the pro-segregation legislation. Second, Starr wrote an almost daily column during the 1957 regular session of the Arkansas General Assembly. The column, titled "In the Legislature" was written in Starr's folksy style and seemed to designed educate readers about how the state legislature worked and what was going on there. It was published in the Northwest Arkansas Times. His columns show that Starr voted for all four 1957 legislative proposals intended to support efforts to keep Arkansas' schools segregated. However, despite these votes in favor of the anti-desegregation bills, Starr maintained that he opposed at least some of the legislation for which he voted. The four bills were passed with no debate and only one vote against them. As noted above, they created a "Sovereignty Commission," dropped requirement for compulsory attendance in integrated schools, permitted school boards to use school money for attorneys in fighting integration, and made persons and groups engaged in certain kinds of activities to register with the state and report in income and expenses. The latter measure was intended to force the NAACP to reveal who provided it with financial support. Many of the people in our district seem decidedly disturbed about the [segregation] bills, and about the vote of their representatives on the matter. After conversation with several of the people by phone and by word of mouth while I was home over the weekend, I have the feeling my explanation as to why I voted as I did was accepted. Christ once said, "Ye shall know the truth and the truth small make you free." You who are not down here in the midst of this confusion do not always know the truth. Even if you did know the facts of the matter, you still would not know exactly how to react to certain situations unless you also knew all of the implications involved. Even when we voted on these matters last fall, I had the feeling the Supreme Court would have its say, and would undo the whole shebang. I have the same feeling about these four bills. Someone very emphatically inquired why we wanted to shift the burden to the shoulders of the Supreme Court? This person seemed to think in so doing I was neglecting my duty as a representative. What some folks don't know about the making of laws is that if you are going to get the things done you want done, you sometimes have to help the other fellow do some of the things he wants done. It is a matter of: You scratch my back and I'll scratch yours. As this country was being settled there was a custom of helping each other roll their logs. Naturally if you didn't help the other fellow, then he didn't help you. Whether it is good or bad in politics, I wouldn't attempt to argue. I have a feeling -- and this is purely a feeling -- that the governor told the legislators from Eastern Arkansas who were bitterly opposed to the increase in sales tax that if they would help put over his program he would try to help them with their segregation problems. Maybe he didn't know how far-reaching these bills were. He may have not been aware they would cause any more feeling that did the ones voted on last November. He did state he was for them, and he is quite a bit smarter than I ever hope to be. Time is the element that will take care of our problems. We are in an altogether different setup in Fayetteville relative to this question than are the people where the races are half and half. They will have to have time to absorb the shock of this impact which tends to destroy a thing that has been a part of their way of life so long. I cannot always guarantee my vote as recorded to be vote I would prefer to give. I still reserve the right to refuse to light the fuse that would cause a stick of dynamite to be discharged right under my feet. Sometimes a member of this body votes contrary to his conscience because it is not at all a good feeling to have a rug snatched out from under you. It seems that the segregation bills -- like the poor -- will be with us from now on. Yesterday the Senate passed all four measures but two of them were amended. Those amended will now come back to the House to be voted on again. Then they have to be signed by the governor. Senator Wade voted against the two amended bills -- HB322 [creating the Sovereignty Commission] and 324. They were the most vicious of the set. However some think the most undigestible parts of them were amended out. Later we will have the task of voting for or against a $50,000 appropriation to make 322 work. In this matter of making laws, each member has a very little stick. One vote out of 100 is a very small way of speaking your sentiments. Not one time since coming here has one vote made the difference in passing or failing to pass any measure. Yet each member feels he has a big responsibility. Letters are still coming in regarding the matter of segregation. One lady sent down a letter of two and a half typewritten pages, with 20 odd questions about how to yet put a damper on these bills. They only way they can be stopped is to vote down the appropriation of $50,000 for setting up the commission on the sovereignty measure. There will be some votes against it. Should the Washington County delegation vote against it, the appropriation for the University will come in for some very careful study. If the appropriation for the segregation measure is handled as the bills were, there will not be much choice in the matter. You, too, could possibly recognize a steamroller if you saw one about to run over you. The boys who have this thing so much to heart will simply have to have a little more time to get themselves adjusted. The change is inevitable, but they do not see the handwriting on the wall. These columns show the mind of a practical politician rather than a reformer who might be cited as a "profile in courage" or a moral crusader. Starr seems to say that the opposed the bills; indeed, he thought some of them were "vicious." However, he voted for them because (1) the Supreme Court would likely undo them, and (2) he was scratching backs so they would later scratch his. Starr suggested that even though he did not favor the bills, he could not stop them with his one vote; on the other hand, he says, if he and his Washington County colleagues opposed the bills, the appropriation for the University of Arkansas might be jeopardized. He seemed to think that opposing the "steamroller" would not only be futile, but also cause a "stick of dynamite" to explode at his feet. Besides, Gov. Faubus was for the bills, and "he is quite a bit smarter than I ever hope to be." If we take him at his word, Starr viewed integration as inevitable in the long run, and he favored giving the staunchest opponents time to adjust to the changing conditions. I do not know if he advocated this position because he really believed that racist views would change or because such a "moderate" approach to segregation could be used almost indefinitely to delay integration. Perhaps his arguments for his votes for segregation legislation make sense, and certainly it not fair to judge Starr, in retrospect, too harshly. Almost all state representatives and senators voted for all of the proposed anti-desegregation bills. Nevertheless, whatever the practical reasons for his vote, Starr ended up on the wrong side of history -- as did almost all Arkansas state representatives and senators who served in the legislature from 1955 to 1958. We look back at their actions during these crisis years and regret the stands they took. After serving his first term (1955-1956), Starr was elected to a second term in 1956 without opposition. He did not run for re-election in 1958.